At Market Connections, we often tell our clients that buyers and decision-makers sitting in federal government agencies are people, too. They are often affected by general trends as much as the person who lives next door. 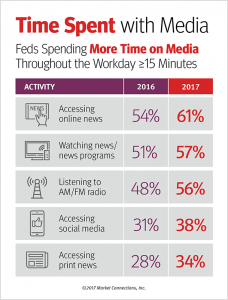 Result trends we found in our recent Federal Media and Marketing Study are also being found and reported by additional parties both in the federal space and the general market. Over the past 18 months, the media has come under increased scrutiny. False or exaggerated stories have been spread through social media, often by nefarious actors. This “fake news” may have damaged the credibility of news and information sources. 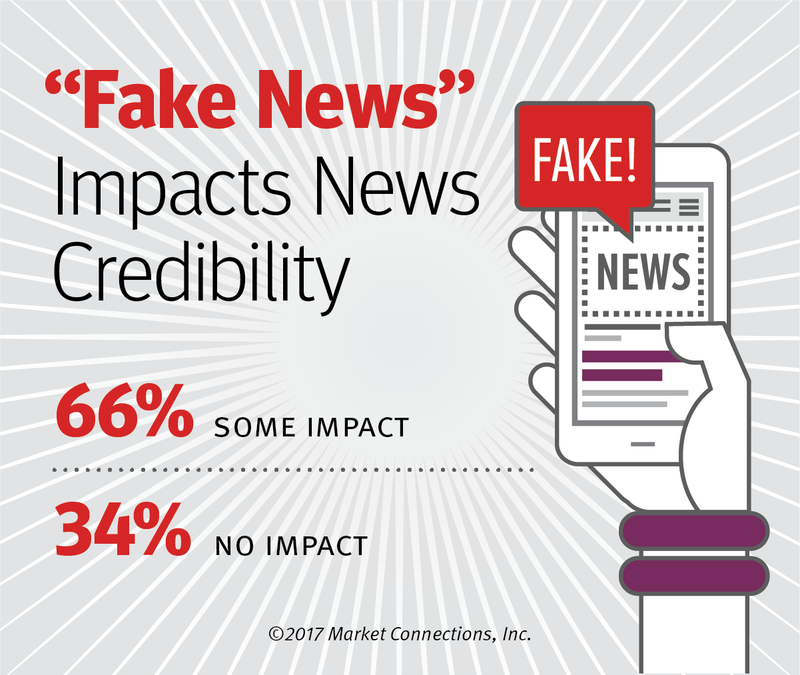 Market Connections asked about the impact of “fake news” on the credibility of news sources among federal government buyers and decision-makers. Two-thirds of respondents mentioned that there was some impact on their perception of news organization credibility. In addition, we saw a rise in the number of media sources accessed. This is a potential result of decreased trust in a single news source. Publishers are recognizing the impact of the term “fake news” in their industry and responding in kind. In a recent story, MediaDailyNews reported on a group of well-known news publishers including The Washington Post, The Economist and The Globe and Mail who are setting transparency standards that allow the public to determine the quality and reliability of journalism. 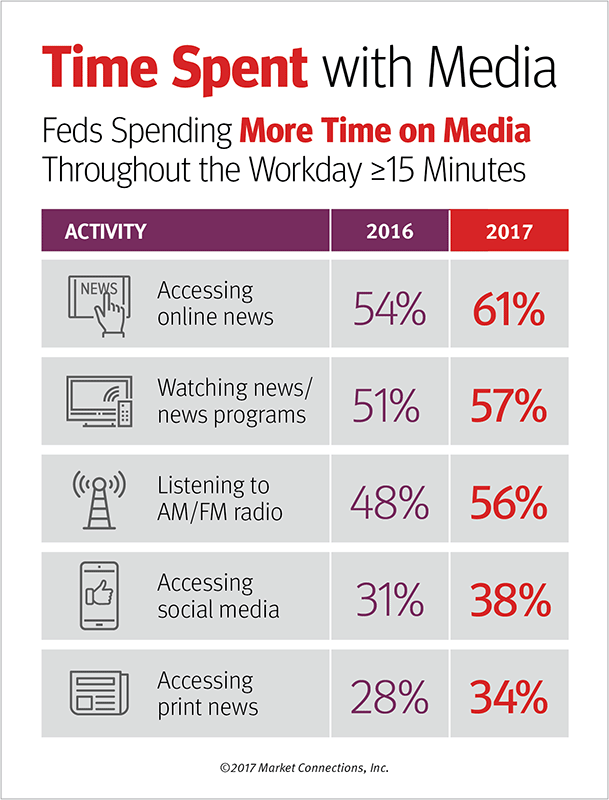 What does this mean for federal marketers? Remember that although we are in a niche market, our audience is like everyone else. Your target audience is relying on more sources to get and verify their news and information. Don’t discount trends in the general market and use tools like the Federal Media and Marketing Study to help you make decisions about your market strategy by allowing you to better understand the depth and breadth of the readership, viewership and listenership in the federal market. Download the report to see how the study results may impact your 2018 media mix and strategy. Get in-depth insights with the FMMS data tool. This is a dynamic web-based reporting tool that allows you to cross-tabulate survey results to create your own customized data views, such as job title and product purchases or job title and website visits or publication readership. Government decision-makers, especially those in Defense agencies, are questioning the credibility of media outlets due to the onslaught of “fake news,” according to the early results from the 2017 Federal Media and Marketing StudyTM. Two-thirds of decisions makers said recent commentary about “fake news” has had at least some impact on their perceptions of news organizations’ credibility. Moderate to major impact was significantly stronger with respondents from defense agencies (53%) relative to civilian agency respondents (39%). If decision makers are feeling somewhat skeptical about content coming from media outlets, what do they trust? At the top of the list: recommendations from peers and colleagues at 51 percent. Respondents also put stock in the content professional associations provide: 42 percent trust white papers and case studies these associations publish, 41 percent trust content on their websites and 39 percent trust content in their webinars. What does that mean for marketing to the federal government? Perhaps 2018 will be a good year to team with professional associations — whether submitting articles for their journals or creating a webinar. These early results are only one data set in the comprehensive study of more than 3,000 federal decision makers. The full results will dive deeper into when, where and how federal decision makers consume content. Registration is open now for the 9th annual FMMS breakfast and briefing event. While you’re waiting for the results from the 9th Annual FMMS, download the 2016 overview report to learn more about the media habits of your target audience.